Studio package synopsis: Dare To Look Into The Eyes Of Madness! Fantastic tale of heart-pounding suspense, this harrowing and terrifying sci-fi shocker will fascinate horror film fans. Starring Ray Milland, it charts the startling transformation of a doctor so blinded by ambition that he dares to glimpse eternity! 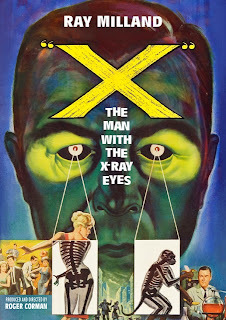 When the brilliant Dr. Xavier (Milland) concocts a serum to improve human sight, he stumbles upon a formula for x-ray vision. Inspired by its awesome medical potential, but shunned by his short-sighted colleagues, the doctor tests the potion on himself, only to discover that his ability to see through walls, clothing and flesh is slowly eclipsed by and insatiable desire to look still further - even if it means seeing more than any mortal can bear! Well, there's certainly a lot of exclamations in that description. Something strange happened on the way to the making of this film. The usually exploitative Roger Corman (director of films as diverse as "Attack of the Crab Monsters" and "Swamp Women") became far more ambitious around 1960 when he started working with more literate scripts (by such luminaries as Richard Matheson and Charles Beaumont) for his series of films adapted from the works of Edgar Allan Poe, most starring Vincent Price. In the middle of all this Price and Poe, Corman found himself directing what would turn out to be a superior science fiction film, one that's nearly profound in its implications. While Corman's abilities as a filmmaker are generally strong he wasn't always known as a director with intellectual intentions but in the case of "X" he had a strong science fiction concept to visualize. Running a tight 79 minutes, "X" benefits from a fully committed performance by Ray Milland (Academy Award winner for "The Lost Weekend" in 1945) as the doomed Dr. James Xavier. Other than the party scene where Xavier realizes he can see through everyone's clothing, the picture is generally free from comedy. It even achieves a certain melancholy feel in the final third, in particular the sequences set in the seedy carnival pier and when Xavier sets himself up in the slums to become a "healer" to the poor. While the special visual effects that are used to convey Xavier's new "sight" are not exactly state of the art, they are perfectly serviceable for the film and also contain few elements that certainly could have been influenced by the psychedelic drugs of the day. Corman regular Les Baxter is on-hand to contribute a strong music score. Note: the official on-screen title is "X" - the subtitle was only on the advertising and marketing. Minted from a newly created (in 2014) HD transfer from MGM, Kino's Blu-ray of "X" is terrific. The picture quality (reproducing the original widescreen 1.85 theatrical ratio correctly) is solid, with only a few minor instances of dirt and debris cropping up - mostly in the optical effects and scene transitions - but never enough to detract from the film. Film grain appears to be well rendered with no visible artifacts that would indicate that overzealous digital processing was used. The two channel mono sound is flagged correctly to make capable audio processors automatically decode and route it properly to a single center channel speaker. Frequency extremes are somewhat limited, which is to be expected given the low budget nature of the film, and there is a trace of sound distortion in the early going that clears up. Overall, the transfer compares favorably to the excellent 35mm print I ran of this film back in 2013, so MGM must have quality elements on hand and did an excellent job preparing this master for Kino. The Blu-ray has decent supply of extras on-hand: the theatrical trailer (and just what does "Filmed in Spectarama" mean, anyway? ), a "Trailers from Hell" segment with Mick Garris, a spoiler-laden introduction from Joe Dante (to Kino's credit, there's a text screen warning the uninitiated to not watch it until after seeing the film), and two optional audio commentaries: one by Roger Corman (from MGM's DVD release in 2001) and a newly-recorded one by writer/publisher Tim Lucas. Also included is the rarely seen 5 minute prologue that was added to the initial TV prints to pad the short running time. Contrary to what's been in written in some reviews, the prologue was only for the television viewings and was not shown theatrically. This Blu-ray from Kino Lorber Studio Classics is Highly Recommended. The last time I saw this title was on the 4:30 movie so it's been a few years. I remember enjoying it and am looking forward to seeing it properly, in the miracle of Spectarama! The Corman films were my childhood introduction to Ray Milland, starting with Premature Burial and continuing with Panic in Year Zero and "X". While I loved Vincent Price and the others, the tone that Milland brought to films was something special, and I always thought he was perfectly cast in these Besides, who could better leer at naked bodies while attempting to do the Twist?